Private operators for some 520 routes? A few quick thoughts. First, it’s amazing that once-beleaguered Metro is now the belle of the ball: everyone wants to buy bus service these days. Unfortunately for the agency their base capacity planning has not kept up. The proposal to haul coaches up to Kirkland every morning from a far-flung base doesn’t seem like a great idea, but Metro has limited supply and two customers (Sound Transit and SDOT) showing up with bags of cash so it’s not surprising they’re setting the terms and charging full price. Second, I’ve seen people conflate this at times, but “private” does not automatically equal “nonunion.” As the Times article notes, Sound Transit contracts to Community Transit for some service, and CT in turn subcontracts to First Transit (using union drivers) for some routes. The City of Seattle proposed using private shuttles recently, but the city council shot down the idea. Third, it would be a surprise if the winning bid ended up being a nonunion private company, as the ST board is full of elected officials who need union support. That said, the agency is always under the gun to spend taxpayer dollars wisely, so a little due diligence, even if it comes to nothing, might help on the political front. Finally, if Sound Transit does indeed have cash to throw around at buses, how about increasing the frequency of the 550, which currently goes to a sad 30 minutes after 7:30pm every day (and all day Sunday). Trains with 10-minute (or better) headways will start running that route in just a couple of years, doesn’t it warrant more than half-hourly service today? Or consider the 512, which will (eventually) become a train as well? Is half-hourly on Sundays really the best we can do? Look at Denver for an example. The question shouldnt be union/non-union. Workers have the right to organize. In Denver, RTD runs 58% of the bus service themselves and contracts the rest to First Transit and Transdev. RTD and First Transit drivers belong to the same Union, ATU 1001. The pay difference between those groups is significant. At RTD you start several dollars and hour higher, have better work conditions in the contract, and reach top pay in 54 months. Top pay at FT is at 132 months and isn’t close to that at RTD. FT is solely focuced on the profit the company gets. It’s unfortunate that ST is at this point but if they don’t have capacity with their existing partners they need to go somewhere. As I recall, it was the Unions that showed up to defend Sound Transit during Sen. O’Ban’s taxpayer-funded “investigation” of Sound Transit tour. Ticking off the Unions may be penny-wise and pound-foolish. One of the weaknesses of contracting with Community Transit is that First Transit’s contract with CT is for a limited term. If FT doesn’t win the next contract, all those operators get transferred elsewhere, or get let go and have to get re-hired under the winning contractor. That winning contractor, of course, will not be expected to honor any contract between the FT and the existing union. Union drivers may just take their skills elsewhere. Service hiccups are to be expected in any set-up where a there is a change of contractors operating the service every few years. If Sound Transit wants reliable service on ST Express and STRIDE, it will ask for directly-hired employees not subject to periodic rehirings to do the driving on ST routes. The problem is sound transit’s over emphasis on rush hour, choosing to spend their money buying more buses that run two one way trips per day, rather than running the buses they have for more trips. The thought of sending a bus out from Everett to take one load of passengers from Redmond to Seattle, then drive back empty to Everett, then repeat the same thing in the afternoon in reverse makes me cringe. It doesn’t matter how packed the bus is when it’s actually carrying passengers. A service where 80% of the miles are deadhead miles in guaranteed to be very inefficient. It gets worse: those deadhead runs don’t qualify for FTA grants, so they are doubly costly for the agency. A couple of agencies have had to give money back due to reporting of deadhead hours as service hours. Most CT-operated buses do not deadhead after their morning runs or before their afternoon runs. A bunch of them lay over for the day in a SODO lot. I presume they have a similar arrangement with Metro for those buses to lay over at East Base during the day. Since STRIDE is expected to be a permanent service, in contrast to the original expectations for ST Express, shouldn’t Sound Transit buy and operate its own bus base, and begin training its own operators? Metro would probably be happy to provide consultation on how to start it up. Same with Link. Only ST would have the capacity to train and employ conductors and have them work out of the bases closest to where those employees live, across three counties. Classroom training might occur at just the SODO base, but ST could provide essentially zero-cost transportation to get to the class. There is also the matter of the Metro mega-pick, where an operator may jump between the E Line, the A Line, conducting a Link train, and then going back to the E Line. Not having the service disruptions we are used to experience every 6 months would be a nice feature of direct ST employment. Those hired as conductors would remain conductors as long as they want and meet performance standards, and not get bumped out after 6 months by someone who has had it with driving a bus. It might save them a bit of money to contract out operations and just focus on capital construction, i dunno. I’m personally a fan of regional unification into a single Sound Transit Authority, but that seems like a political football unless traffic continues to worsen. If that were to happen, imagine what would happen when the union representing transit operators for three counties votes down a contract and goes on strike. Are you sure you want that? We can easily prevent that eventuality by not trying to gouge out the union. For most of its history ST has not seen itself as an operations agency but as a planning, capital improvement, and overseeing agency. “The existing agencies do operations, why do we need another?” ST did take on Tacoma Link, I assume because Pierce Transit had no experience with rail or expectations of it otherwise, Central Link wouldn’t open for years, and Metro was involved with the SLU Streetcar and potentially others. ST Express is officially an interim service until light rail or other high-capacity transit comes to those corridors (although some of them may never have it). With Stride maybe it does make sense to operate it in-house. However, I suspect intertia will keep it contracted, unless that seriously breaks down and contractors are unavailable. And how about spending existing service hours more wisely and skip Mercer Island on every other trip during periods of low demand (weekday mornings eastbound/evenings westbound). Huh? Periods of low demand is where it’s the least time consuming to detour to Mercer Island, and where there is the most unused capacity that Mercer Islanders could be provided with for nearly free. There’s more of a case to do this in the peak of peak, when buses are filled to the brim and a stop in MI to drop off passengers takes 10 minutes (because of people trying to get through the standing passengers) and 90+% of people here are just trying to get to Seattle. Even during peak, people will start using the 550 to transfer to the 554 at Mercer Island, with the 555/556 no longer going to Issaquah. Or just take the 271. Then you can avoid the awful horrible 550 altogether. Then transfer to 554 in Eastgate if the timing works, or stay on the 271 if it’s an Issaquah trip. You can do that, but it’s going to take a long time. Even on weekends, it’s consistently slower than transferring and, on weekdays, the 271 adds grand tours of Bellevue College and various office buildings, on top of it. 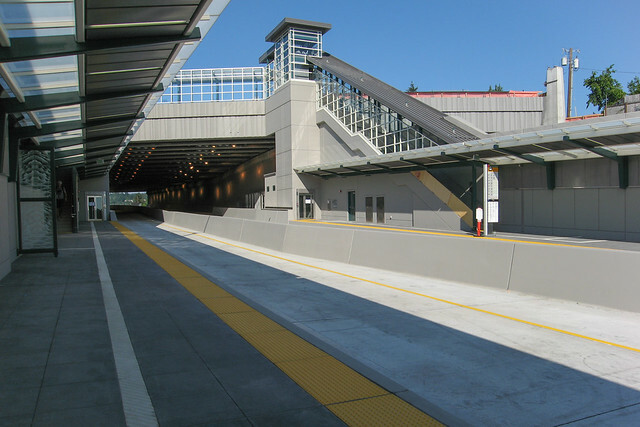 Do you realize that Mercer Island is the 4th busiest stop on the 550 after Bellevue TC, Westlake, and IDS? You don’t cut service to one of the busiest stops on the highest ridership ST Express route. By your logic we should skip IDS too. If anything Frank is right, we should be increasing overall 550 service. Westlake, IDS, and Bellevue TC don’t add 10 minutes to the route. I don’t think Mercer Island does, either, but I haven’t ridden the 550 during peak-of-peak in years. At any rate, a peak 551 route that skips from SODO to Bellevue TC would probably draw plenty of ridership to justify its existence, while we wait for East Link, and Mercer Island would still get Link-like frequency on the slightly-less-frequent 550. @Brent, see this discussion from four years ago? Comparing the schedules for the 216 and 218/219, Metro thinks the deviation to Mercer Island costs 3 minutes. So, serving Mercer Island adds significant ridership and doesn’t cost an excessive amount of time. You forgot the part where the mayor, on the private shuttle concept, said I’m doing it anyway and went around the council. Here is the latest I could find. Do you have something more recent than that? I see that ST is still advertising ridehail ride discounts to/from stations, but that is a different market than the shuttles to downtown from Ballard etc that the mayor was originally proposing. Ride2 has been operating for a while in West Seattle and will be expanding to SE Seattle per the mayor’s state of the city address. I’d point out that Metro contracts service and their vendors don’t use union drivers. Hopelink is probably the biggest benefactor of Metro contracts and treats their drivers as bad or worse than First Transit. 1. Metro has an apprenticeship program that trains people to be, among other things, professional drivers. 2. Mayor Durkan has money at her disposal to subsidize said program. 3. Metro, and every other transit agency, desperately need more drivers. I might add: increase service on the 560 too, which is hourly on weekends and jam-packed on Sunday morning. Most of that route will soon be I-405 bus rapid transit. Don’t they want to induce some demand? …Wow. Voters should not just shrug this off. Is this a rare case of the unspeakable truth being clearly stated for all to see? The RFP was released on the DL so you know it has to be bad. TRU has a handy email form for you to let the board know how you feel. One might have thought the Transit Riders Union would be in favor of 60 more buses providing more transit service. But maybe it’s not about the riders for them.